I have been thinking about getting back into blogging for a while now, so when my mom told me that my grandparents (the only people who regularly read this anyway) missed hearing from me, I decided that now is a good time to start. 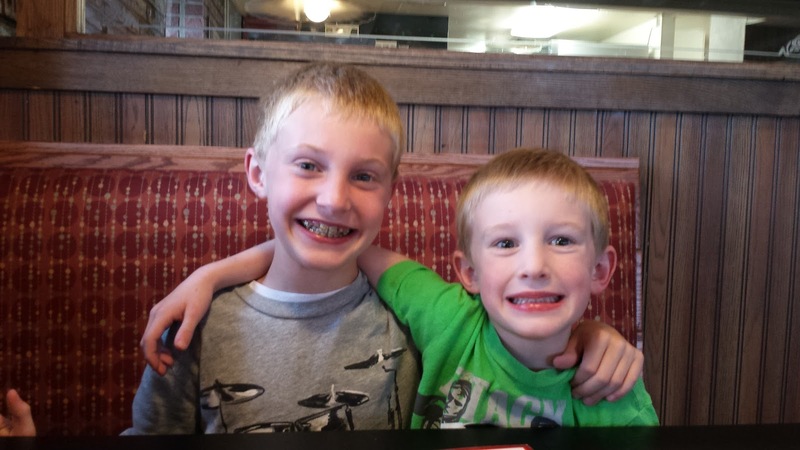 I haven't blogged since right before Chris's surgery last year, but I think it would be impossible, and probably boring, to try to recap everything that has happened between then and now. Instead, I'm just going to run through the highlights for each person and try to be more proactive on the blog from here on out. Let's start with Chris: he is doing well. His surgery in September was successful, and we almost don't even think about it anymore. Sometimes I even get a little start when I see the scars on his chest. His recovery felt long, but after the prescribed twelve weeks, he really was back to normal. He says he doesn't feel like Superman, but he feels like himself, and his heart sounds strong and healthy. The doctors and nurses at St. Alphonsus were incredible, and we'll always be grateful for all of the help we received at home, particularly from Chris's mom when she spent the week with the kids. Since then, Chris has been keeping up with his sports teams, working, taking classes, and hanging out around the house. He finished up another straight-A semester, and he only has two classes left this fall before he graduates in December. TWO!! We're both pretty excited to close that chapter. Chris was an assistant coach for Gordon's soccer team this Spring which usually meant getting to act as the volunteer ref. He did a good job running up and down the field and giving the evil eye to sideline parents who questioned his ruling (one of whom may or may not have been his wife). 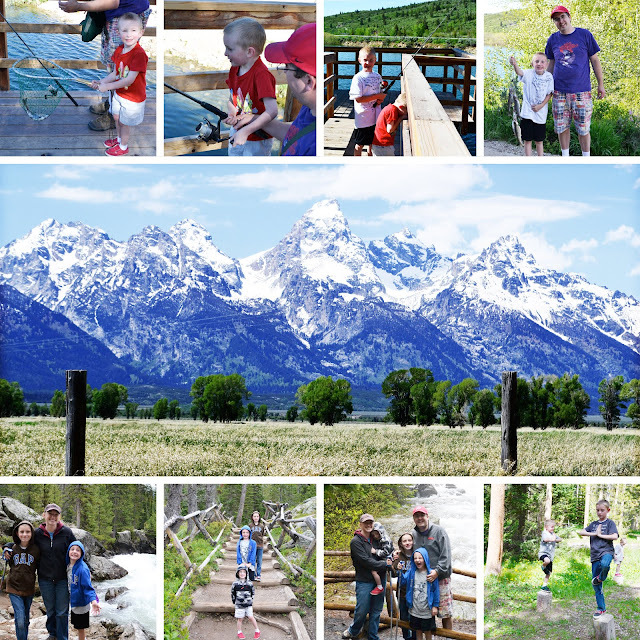 Chris took the boys to the fathers and sons campout in June, then the five of us went on another weekend getaway to the Idaho side of the Tetons. We were pretty excited to use our giant new tent. No more kids camping in the van! 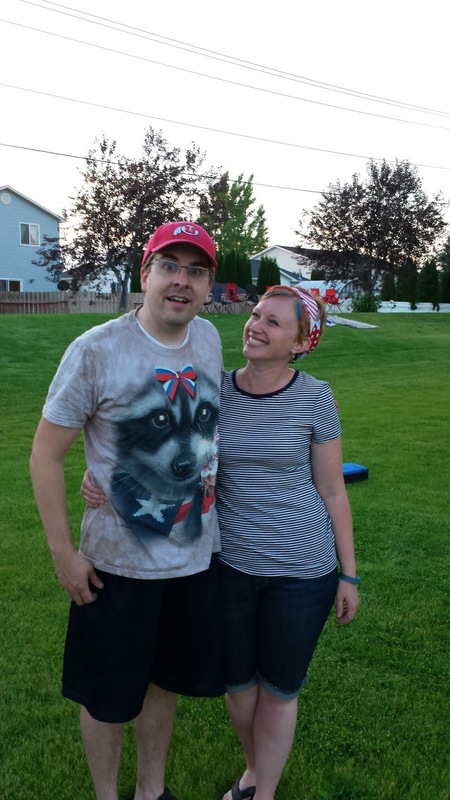 As per tradition, we had a 4th of July party this year, complete with ridiculous t-shirts. I think they're getting worse every year. As for me, I've been keeping very busy with all of the stuff I like to do. I finished my semesters in the fall and spring, then started with another half-time load this summer. I'm finished with all but one class this summer, so I'm feeling pretty relaxed. The new school year is going to be crazy, but we're used to that, right? In addition to classes, I worked as the Student Activities Board Director last year, and this year, I'll be the Vice President for the Idaho Falls campus. I know it seems like a lot, and it is, but I really enjoy being involved, and I like the experiences I'm having and the people I'm meeting that I wouldn't otherwise. And now I get to put "Vice President" on my resume. I've also been doing quite a bit of running lately. A friend and I are training for a half-marathon in August, so we're pretty diligent in getting our miles in every week. In conjunction with my training, I've participated in a couple of races. There is something so fun about running with a community; I just love it. 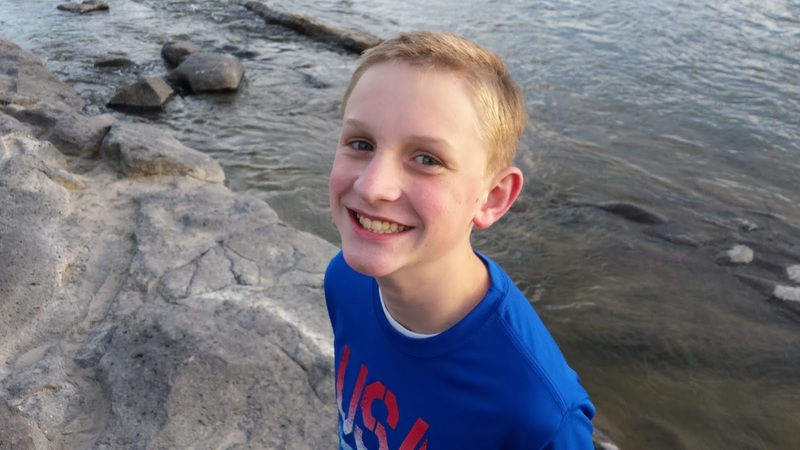 Thomas had a very smooth year for his first year of junior high, and we're hoping for more of the same in 8th grade. Tom still plays the piano, of course, and he got a perfect score at the Piano Festival this year. I was so proud of him! Tom enjoys the quiet life at home, so most of the time, you can find him doing something inside like playing a video game or working on learning a popular song on the keyboard. He still chats with his best friend, Nathaniel, in Norway almost every week. 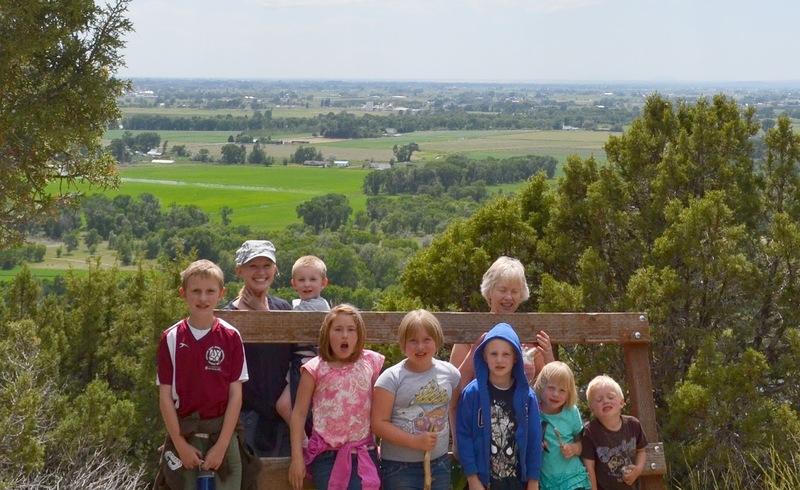 Nathaniel and his family visited Idaho last week, and it was so much fun for them to hang out in real life. 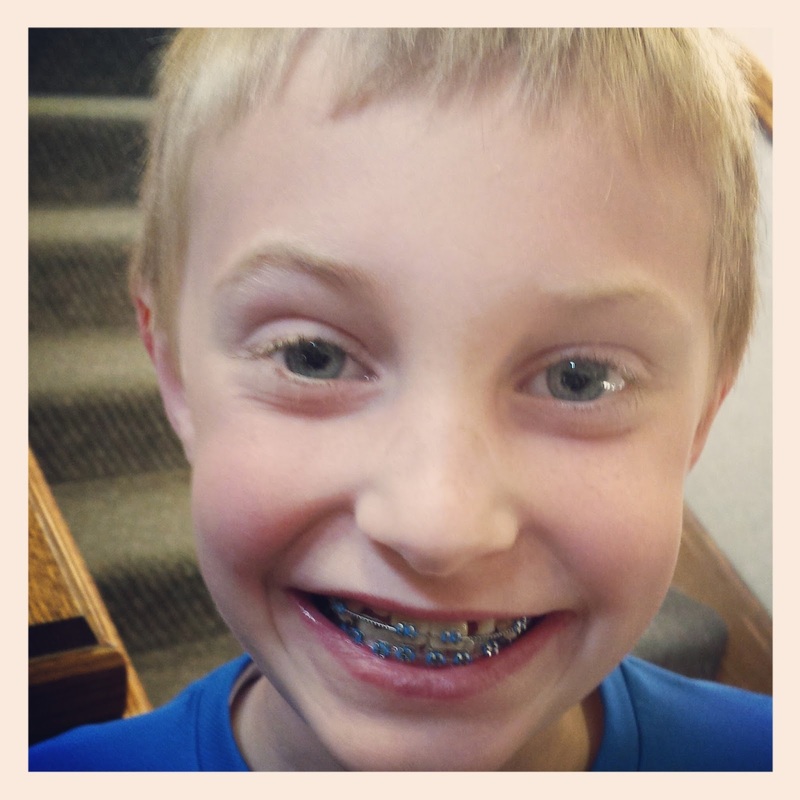 Tom is getting ready for Scout Camp next week, and he plans to hike Tablerock again. I'm excited for him, and hopefully this time he'll take some pictures! PACE Toy Company Presentation-- "Tekno Toys"
Gordon also won 2nd place in the Pinewood Derby and got a full set of braces put on. 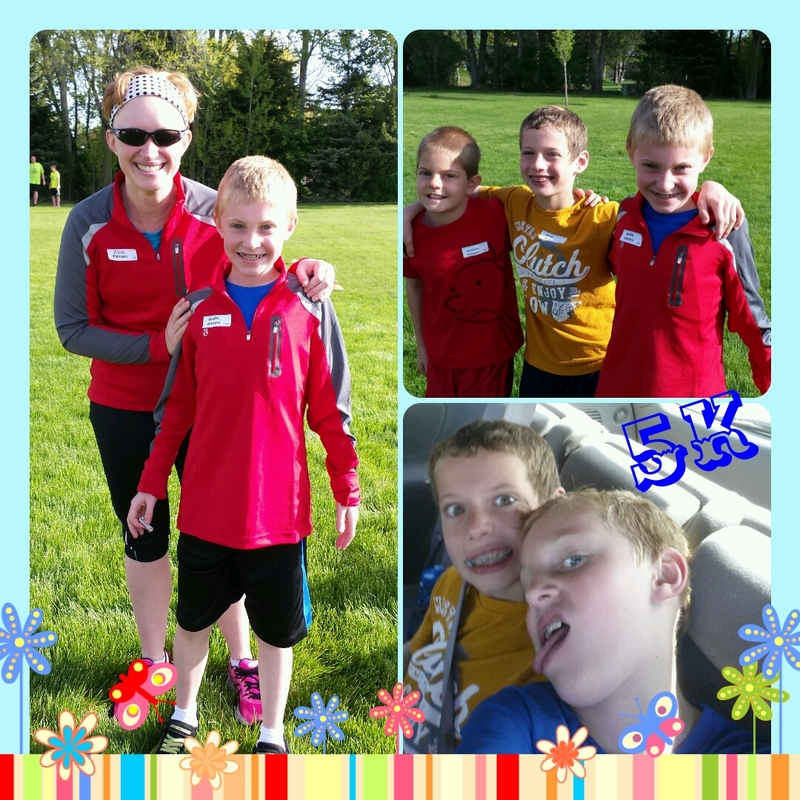 Gordon ran his first 5K in May with some friends, and he did a great job! 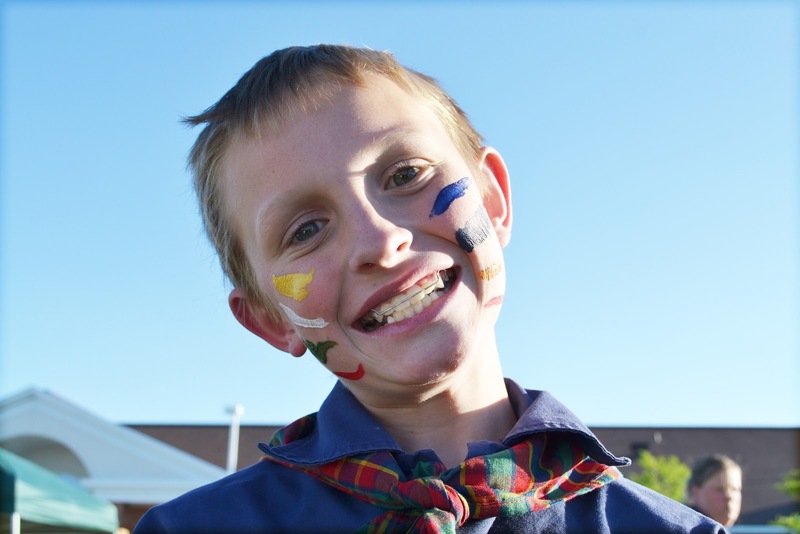 Next week, Gord will participate in Soccer day camp all week, and he's looking forward to swimming lessons later this summer. Finally, we're on to Neil! Neil had a fantastic year at preschool and will be returning to the same school in the fall for Kindergarten. He is excited! Neil hasn't felt ready to participate in a lot of activities so far, but he does plan to join Gord in swimming lessons. Neil can be found anywhere Gordon is-- they're best buddies. 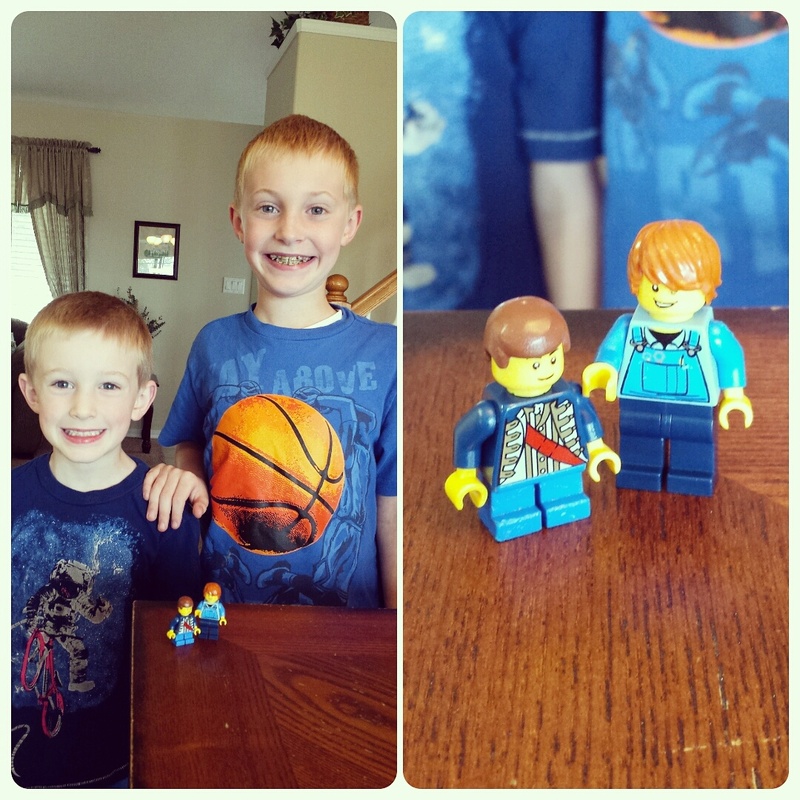 They made these Lego minifigures of themselves. So cute. That's it for today's quick life recap. I feel like I just skim a very shallow surface when I blog like this, so I really am going to try to blog more regularly and hopefully get past the travel log. At least it's an update, right? To tell you the truth, it feels a little bit obnoxious writing a post about the subject of Chris' health on a blog, especially when I haven't updated the blog with normal, everyday life since the beginning of this year. However, Chris and I agreed that it might be a good idea to have all of the details in one spot so that we could just refer people here to get as little or as much information as they care to read without our having to reiterate the story a million times. In a nutshell: Chris has a diseased heart valve which needs repair. He is scheduled to have heart surgery on September 17th in Boise, ID. For more details, read on. If you asked me to identify a mitral valve four weeks ago, I am sure I would have guessed wrong. I knew the aorta had something to do with the heart, and I probably would have remembered something about four chambers and pumping blood, but other than that, I usually think of the heart in a much more metaphorical sense. I like to think of the heart in terms like this: "Hear my soul speak. Of the very instant that I saw you, did my heart fly at your service" (Shakespeare, The Tempest), rather than as an organ that keeps your blood flowing. 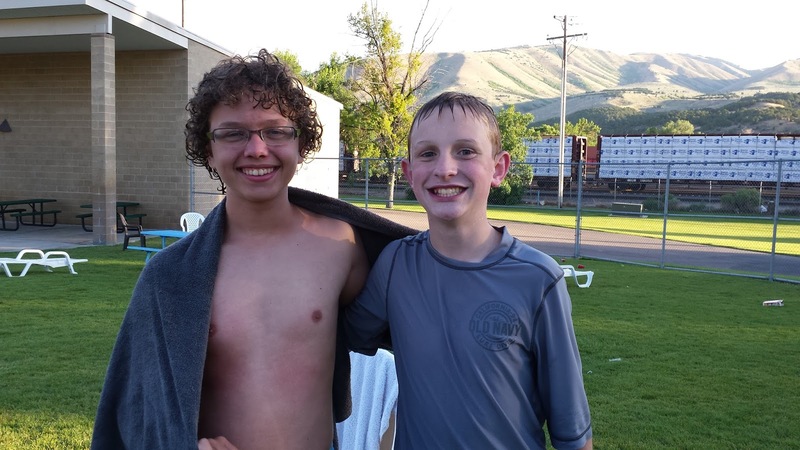 Four weeks ago, Chris and Tom were getting ready to go to scout camp, and they met up with the two PAs in our neighborhood for the routine physicals needed to go. During Chris' physical, our PA friend listened to Chris' chest and heard a murmur, then had the other PA, also a friend, come in to confirm. We weren't terribly concerned at that point—a lot of people have heart murmurs, and most people live perfectly normal lives without the murmur affecting anything. Still, both doctors told Chris that he should have it checked out just to make sure everything was fine. It was at this point that I did a bunch of online research to learn exactly what the mitral valve is and what we need to do about its regurgitation problem. One thing I learned is that mitral valve prolapse is actually quite common (it's one of the things that causes a heart murmur), and that most people with the prolapse have very little regurgitation, so it doesn't affect their lifestyle at all. The doctors we talked to at this point were hopeful that Chris would fit in this category, especially since he doesn't really have any shortness of breath or any of the other common symptoms of this condition. Our doctor referred us to a cardiologist, so we visited with him and learned that Chris' regurgitation is classified as "severe" (terrible word, isn't it?! ), and that the amount of blood being pushed back the wrong way is enough to cause eventual heart failure. The mitral valve works in the left atrium of the heart which is in charge of getting blood to the lungs. Because of the leak, Chris' heart has to work extra hard to supply his lungs properly and in doing so, is actually growing and further stretching the damaged valve, making the problem worse. While Chris doesn't feel any symptoms now*, the cardiologist assured us that, if left untreated, Chris would soon be feeling very short of breath and low on energy, and that the heart disease would eventually lead to full failure. Scary. This isn't a problem that can be fixed with a lifestyle change or medication; both our doctor and cardiologist told us the same thing: Valve repair surgery is the only thing that can cure a diseased valve. * I should add that even though Chris and I don't think he has a lot of symptoms, I am starting to wonder if this is something he has just lived with so long that he is just used to the way he feels. He does get tired very easily, and he often feels light-headed after doing things that shouldn't be that much effort, like mowing the lawn. When I do a race or something strenuous, my face gets red and flushed, and even though I get tired, I usually just need some water. Chris, on the other hand, gets extremely pale and nauseated and has to sit down for a while to recover. I don't know if these are really symptoms, but it seems like they might be. Chris said, "I thought I was just lazy." Anyway, the cardiologist knew that the valve was diseased and that Chris needs surgery, but needed a closer look, so he ordered a transEsophageal echocardiogram, or TEE. Basically, this test required Chris to swallow a probe so that the doctors could get a closer look at his heart from this inside. This link is my favorite on explaining that lovely procedure. This test required a hospital check-in and some anesthetics, neither of which was very appealing to Chris. Here he is getting ready and looking pathetic before the TEE. The TEE showed a closer look at the prolapse, and it revealed that the some of the chords have ruptured that are attached to the muscles that function to open and close the valve. I looked at the ECG while the doctor explained what he was seeing, and even though I have absolutely no medical background, I could see that things did not look right. The door that was supposed to be straight open and shut was kind of flailing in the wind. Before the TEE, we knew that there were two options for surgery: valve repair and valve replacement. Replacement means taking out the valve completely and putting in a new artificial valve while repair means fixing the valve that is already in place. With repair, there is a newer procedure called a thoracotomy that allows the surgeon to go in through the side instead of the traditional open-chest option, offering a much shorter recovery time and less overall pain. Here's a picture of the different surgical options; we were definitely hoping to be the guy in the front. The TEE confirmed that Chris is a good candidate for the thoracotomy which is great news. 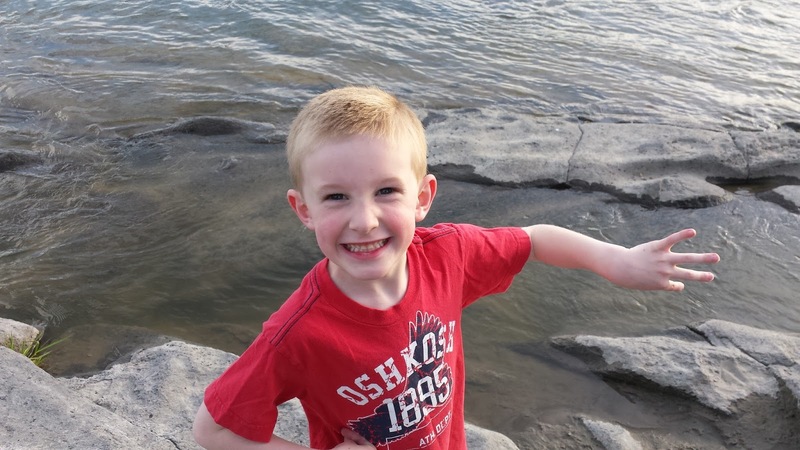 The only downside (aside from the fact that he has to have heart surgery in the first place) is that there aren't any surgeons in Idaho Falls who are experienced in this type of surgery, so we'll have to travel to get it done. Our cardiologist referred us to two cardiac surgeons in Salt Lake City and Boise, respectively. The Boise doctor is in our insurance's physician network, so we were leaning that way, then the Boise surgeon got a hold of Chris right away and scheduled a face time consultation for Sunday afternoon. Yesterday, Chris and I sat on our bed with Chris' iPhone and had an hour-plus long conversation with the surgeon in Boise. We talked about football and food, our families and our time commitments, and of course, Chris' heart, and in the end, Chris and I both felt really good about literally putting Chris' life in this man's hands. We decided to schedule the surgery for September 17th-- far enough away for us to get our ducks in a row, but close enough that the doctor and Chris feel comfortable. The surgeon referred us to this site for a great explanation on what will happen during the surgery. The only part that really freaks me out is that Chris' heart will be stopped and his lung will be collapsed while the surgery is being performed. If I don't think about that too much, I feel confident that this operation is going to be a really good thing for Chris. The surgeon is really excited to work on someone so young-- he said that he feels like he will make Chris into a new man. Through this whole thing, I can't help but feel extremely grateful. 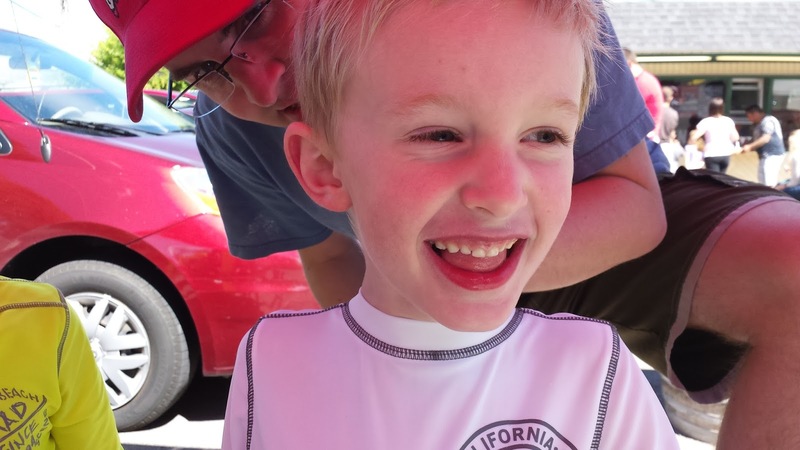 The fact that Chris' condition has probably been around for a long time, but it wasn't heard until what our surgeon called "the keen ear" of our friend is kind of amazing. The thoracotomy procedure wasn't even really around ten years ago, and it has only been perfected and practiced regularly in the last few years. Being able to have a face-to-face conversation with a surgeon more than five hours away is incredible, and being able to meet and see him in that setting was so reassuring. Additionally, we are in a position with our family life and finances that taking a few weeks off for this procedure is going to work out better than it would have a year ago or a year from now. Chris' mom has agreed to come and stay with the kids while Chris and I are in Boise, and we're so grateful that she is willing and able to help us. 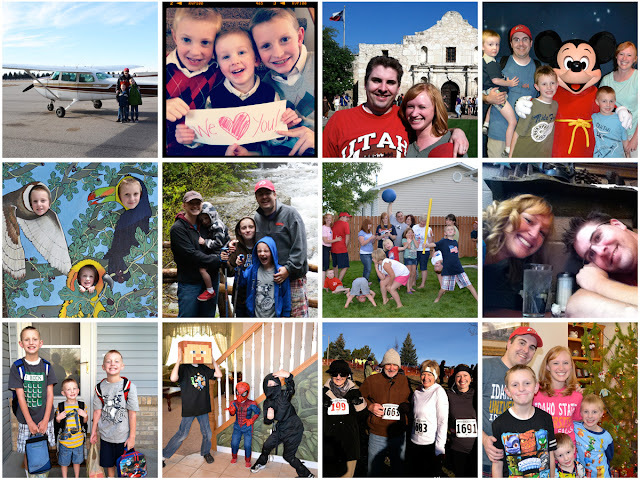 My family is here in Idaho Falls and will be available to help us during the recovery period as well. And of course, the fact that we "caught it now," before Chris suffers any major symptoms or his condition worsens is a huge blessing. So, now I know what a mitral valve is. Heart disease on a 36-year-old sounds scary, but the more we understand and learn about it, and how to fix it, the more confident we are that we're doing the right thing. All in all, we're going to be okay-- maybe even better than okay-- and I can get back to my metaphorical hearts. In 2012 we had adventures, we traveled, we celebrated, we hiked, we ran, and we spent time together. It was a good year and I'm counting on 2013 to be even better. I really wanted to be caught up on my blogging before December, but here it is so soon! I think it's a combination of our busy schedule and the unseasonably warm weather, but this month really snuck up on me. The boys have griped that I don't have a lot of Christmas Spirit (mainly because I refuse to listen to Christmas music before Thanksgiving), so I decided to try to up my holly jolly-ness by doing a "December Daily". This is a scrapbooking term that some marketing genius dreamed up to help scrapbookers take more pictures and buy more scrapbooking supplies in the month of December. Yikes, did I just say that? See, I am a grinch! Really, though, I do think December Daily is a great idea. I did something similar in the summer of '11, when the boys and I did "something fun" every day and I documented most of it with pictures. Admittedly, I was worn out by the end of the summer, but I've recovered in 18 months and I think reincorporating the daily picture/daily activity idea into our December is a good thing to do. After all, I want our boys (and myself) to remember this December, despite our crazy busy-ness, as a happy month of family togetherness. 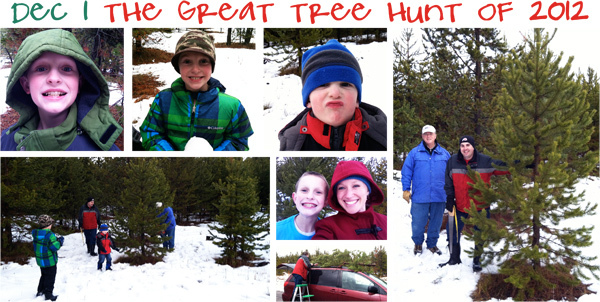 Today is December 1st and we kicked off our December with a trip to Island Park to get our tree. I love going into the forest for a Christmas tree. Not only is the outing itself lots of fun, I just love the trees we bring home. There is something so fun about a fresh-from-the-forest tree-- it has personality. Our weather has been warm, so the boys and I trudged through slushy snow and were intermittently sprinkled and pelted with rain. We didn't have to go far, though, and my dad brought along a very handy chainsaw, so even the thunder and lightening didn't ruin the day. The sloppy snow was great for snowballs (Gordon tried to carry a couple in his pockets), and the boys had a great time running around. We found a lovely tree, now proudly standing in our living room waiting for lights and ornaments. Earlier this evening, we brainstormed 24 different activities (most free!) and I printed out slips to put in the pockets of our fabric advent calendar. On the docket: movies, gingerbread, lights, and more! Happy December! The problem with procrastinating blog updates is that the picture pile (file, rather) keeps growing, but time doesn't stand still while you get caught up! So, I'm going to try to take a couple of days to catch up our Summer and Fall, and maybe be a little more consistent from here. It's just easier that way! May is always a crazy month with the end of school and lessons, so I didn't get too many pictures. 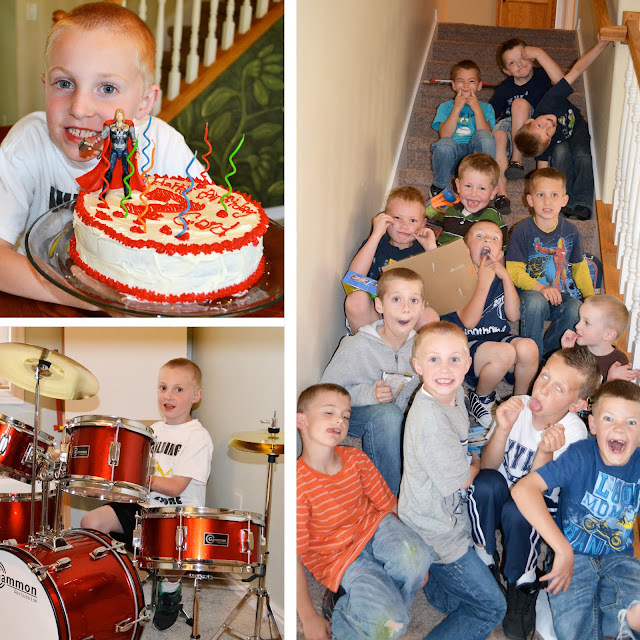 Our dear Gord did celebrate a birthday-- he turned 7 and celebrated with a yummy cake (topped with Thor), a drum set, and an equally loud birthday party with a dozen of his friends. Lucky kid! The last day of school was June 1st, and we picked the boys up and headed North for our first camping adventure of the summer. 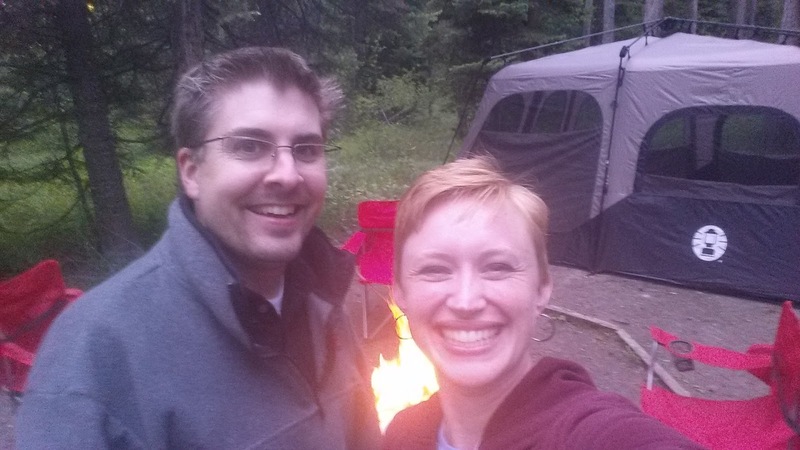 For this campout, we chose Mike Harris Campground, which is just outside Victor, ID. It's a gorgeous spot and we enjoyed being one of the very few campers there. The campground is located just a couple of miles from a family-friendly fishing pond, so Chris and the boys fished for our dinner for the next night. On Saturday, we drove over Teton Pass to Teton National Park, where we rode the boat across Jenny Lake, hiked to Hidden Falls, and went on a buffalo search. It was so beautiful and relaxing-- an absolutely perfect way to start Summer off right! Also starting in June, my mom watched my sister Ann-Michelle's kids once a week. We decided to get all of the kids together and do some fun activities. Our first outing was to Craters of the Moon. 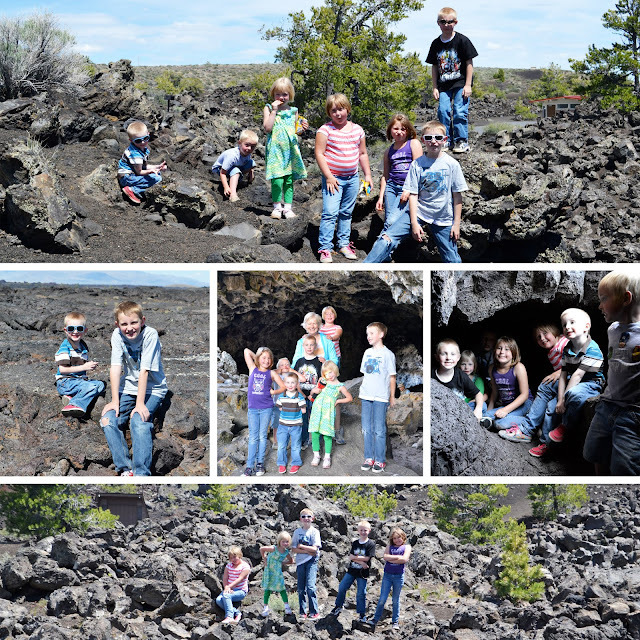 The kids had a great time climbing around the lava rocks and exploring the caves and posing for their future album cover. Next we went on a short hike at Cress Creek. 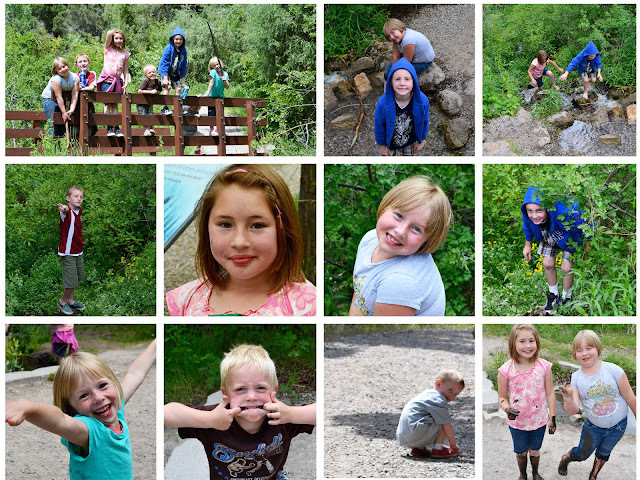 I love this hike-- it's perfect for kids (only about .5 miles) and there are informational signs along the way. The kids' favorite part is hikikng up and down the little creek that runs across the trail. 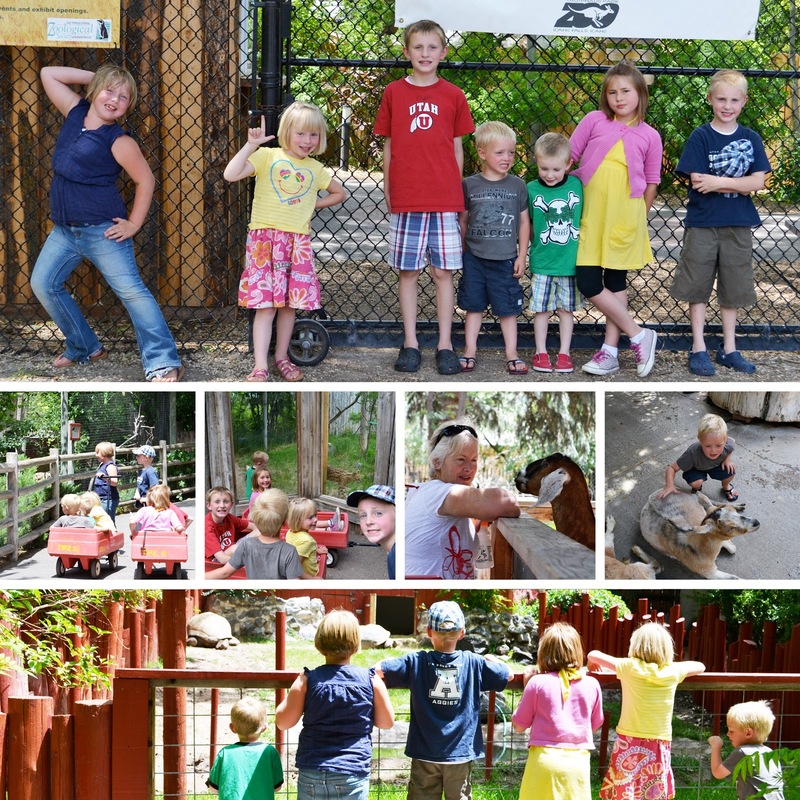 Our last outing in June was to the zoo. Idaho Falls actually has a great zoo that is well-maintained and has a lot of interesting animals. The kids loved pulling each other in the rented wagons and playing in the park afterward. 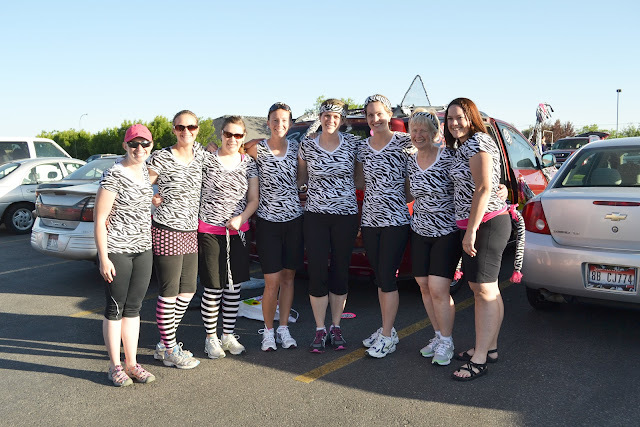 Also in June, my mom and I ran with a great group of six other women in the annual To Bone and Back race. It is such a fun day and we ran really well. 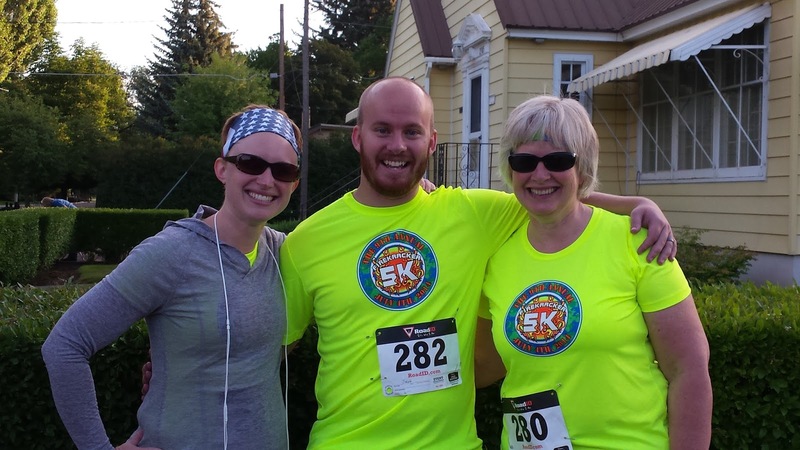 The training for that race kicked off our new running habit-- we're now getting together five times a week to run. It's been great exercise and I've accomplished some goals I wouldn't have thought possible. More on that later. Our Bone & Back team was called "Runnin' Wild" and we had the CUTEST zebra print shirts and car decorations. I'm pretty sure everyone else was jealous! Finally, in June, Thomas earned his "Arrow of Light" award in Cub Scouts. The Arrow of Light is the highest honor in Cub Scouting, and I think he was pretty proud of his accomplishment. Okay! May and June are caught up! More to come!